I bought a bunch of plants on a whim, but don't know what they are. They don't seem to be doing very well, and I want to make sure I'm taking care of them properly. I've tried identifying them online, but have no idea. Also, I want to double check and make sure they are all ok to have around my 1 year old, since he is becoming rather mobile and getting better and reaching things high up, and sticks things in his mouth all the time. Hi Sam, just so you know, it's never a good thing to let babies near your plants. They are absolutely irresistible to little fingers, and they will be demolished in no time. Many succulents have very loosely attached leaves that fall off easily. I recommend putting them out of reach and behind a bird cage to keep them (and baby) safe. So for ID: you have a couple that would be best outdoors, as they are hardy types. This would be #4 (I think) and the extra bonus that you got that is labeled #7. Both of these are Sempervivum, which need to be out in the garden. #1 looks like either Haworthia or an Aloe, sorry I can't see it closely enough to be sure. Have a look at those pages for more detail. 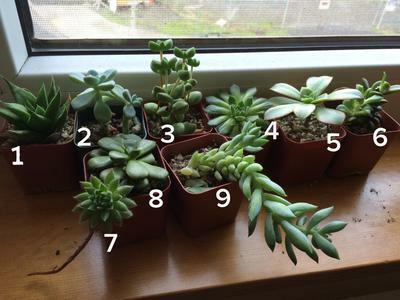 #2 is possibly an Echeveria or x Sedeveria, again, not sure because there are so many that are similar. #4 looks like some kind of Sempervivum. #6 Sorry, need a closer shot to ID. #9 Sedum morganianum, the Donkey Tail Sedum. For general care, have a look on the page about succulent care.